From a whisky standpoint, one of the things I’ll miss most about San Francisco are its annual three big whisky shows: the locally run Whiskies of the World, the mammoth WhiskyFest, and possibly my favorite event, the Scotch Malt Whisky Society of America’s Single Malt and Scotch Whisky Extravaganza. The SMWSA Extravaganza features, as you might guess from the title, primarily Scotch whisky (a few Irish and Japanese malts have been known to sneak in there as well) and it’s a bit more intimate and relaxed than the other two. 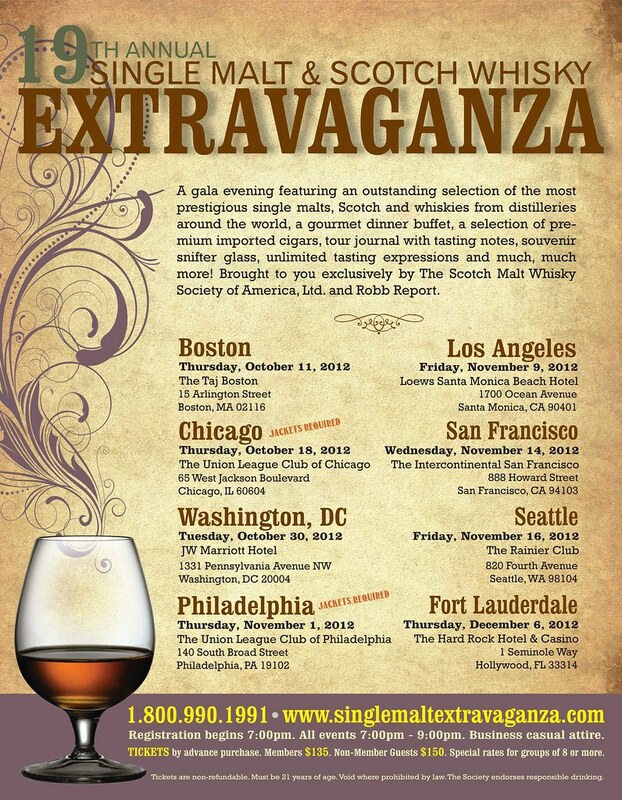 At the San Francisco Extravaganzas that I’ve attended, I’ve enjoyed that slower pace, there’s no pressure to run around and try all 300 whiskies on offer because, well, there aren’t 300 whiskies on the pour list. It’s a more focused list and that slower pace allows for more conversation with the distillery ambassadors and reps. Of special note at the Extravaganzas is the chance to taste several of the exclusive SMWSA bottlings that are only offered to Society members. The Scotch Malt Whisky Society has a great reputation for selecting (and naming) unique single barrel expressions so it’s always a treat to sample a few. I highly recommend this event and am happy to offer readers a discount on non-members tickets. The non-member price is usually $150, but if you enter the code “TC2012” at the time of purchase, you’ll get the member price of $135.